Nov 28, 2001 in "Candlelight Processional"
Noted screen and stage actor James Avery headlines a list of top celebrities who will serve as narrators for the 31st annual Candlelight Processional at Epcot at the Walt Disney World Resort in Lake Buena Vista, Fla. 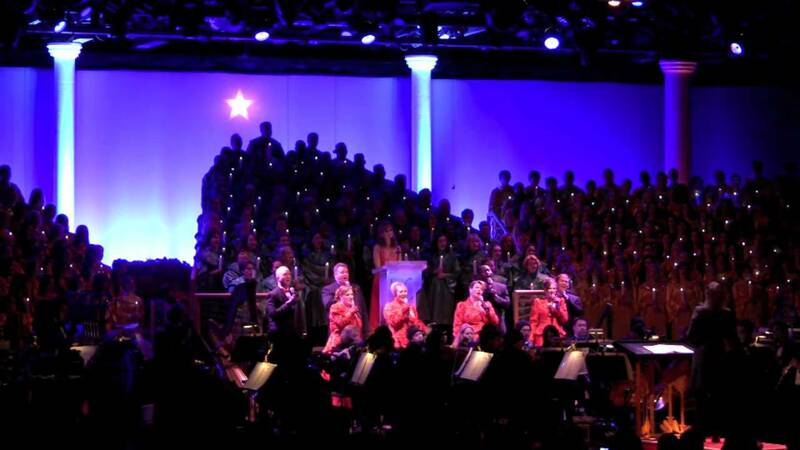 Candlelight Processional is a moving presentation of the traditional Christmas story told by celebrity narrators who are joined by a mass choir and 50-piece orchestra. There are two performances nightly on Mondays, Tuesdays and Wednesdays and three shows nightly the rest of the week at America Gardens Theatre in World Showcase. Show times are 5, 6:45 and 8:15 p.m. On Sunday, Dec. 2, only the 8:15 p.m. show will be available for Epcot day guests. Special dinner packages starting at $25.95 for adults and $10.95 for children ages 3-11 are available. In addition to fine dining at select Epcot restaurants, the packages include complimentary parking, merchandise discounts and guaranteed seating for Candlelight Processional. For reservations call 407/WDW-DINE. Candlelight Processional is part of Holidays Around the World, Epcot's international celebration that features musical groups, choirs, holiday light displays, storytellers and decorations galore. Holidays Around the World is from Nov. 23-Dec. 30 and is included with regular Epcot admission. The holidays are not the only reason to feel festive at Epcot. As part of the 100 Years of Magic celebration at Walt Disney World Resort, guests can enjoy the "Tapestry of Dreams" parade, which promenades around World Showcase twice daily. This colorful spectacle, which has enormous drums, fanciful puppets and spectacular pageantry, celebrates children, dreams and the legacy of Walt Disney. The 100 Years of Magic celebration is a yearlong event that marks the 100th anniversary of the birth of Walt Disney and honors his legacy of innovation, imagination and family entertainment. As host of the critically acclaimed PBS series Going Places, actor James Avery takes his viewers to some of the world's most exotic places. Avery gained TV fame as Philip Banks on the hit NBC comedy Fresh Prince of Bel-Air and garnered laughs as attorney Alonzo Sparks on the UPN sitcom Sparks. He recently returned to series television with recurring roles on Showtime network's Soul Food and TNT's Bull. Avery has written poetry and scripts for PBS, winning an Emmy for production. His feature film credits include The Brady Bunch Movie, Fletch, License to Drive and Eight Million Ways to Die. Academy Award-winning actress Marlee Matlin currently stars on NBC's award-winning drama The West Wing. At age 21, she was the youngest recipient of an Oscar, winning Best Actress in a Drama for her motion picture debut, Children of a Lesser God. Other feature films include Hear No Evil and the AIDS drama It's My Party. On television Matlin most recently starred and executive produced Where the Truth Lies for Lifetime Television and she is currently executive producing and starring opposite Camryn Manheim in Showtime's film adaptation of the Oscar nominated documentary Sound and Fury. Matlin, who is hearing impaired, is national spokesperson for VITAC, the largest provider of television closed captioning, and serves on the boards of a number of charitable organizations. She has just completed a novel for children called Caution: Deaf Child Crossing. Dallas-born actor-director-writer-producer Robby Benson has had roles in more than 40 movies during a career that began in 1972 with Joryd. Benson was the voice of "Beast" in Disney's hit animated motion picture Beauty and the Beast. Orlando native Wayne Brady stars on ABC's hit comedy Who's Line is it Anyway? He also brings laughter as a variety of characters in The Wayne Brady Show, also on ABC. Brady began working in theater and television after moving to Los Angeles in 1996. He performed at the prestigious Mark Taper Forum in its production of Blade to the Heat. He also has guest starred on several TV series including as I'll Fly Away, Home Court and In the Heat of the Night. Award-winning actress Phylicia Rashad is best loved for her role as Claire Huxtable in the hit NBC comedy The Cosby Show. She teamed up with TV husband Bill Cosby again as his spouse Ruth Lucas on CBS's Cosby. Rashad is an established singer and has appeared on the Broadway stage in Jelly's Last Jam, Into the Woods, Dreamgirls and The Wiz. Noted astronaut Story Musgrave was one of 11 scientist-astronauts chosen by NASA in August 1967. A veteran of six space flights, he worked on the design and development of the Skylab space station, serving as backup science pilot for the first Skylab mission, Skylab 2. From 1974 on, Dr. Musgrave helped design EBA equipment for the Shuttle program, including space suits, and he served as mission specialist for two simulated Spacelab flights. From 1979 to 1982 he was assigned to the Shuttle Avionics Integration Laboratory (SAIL), testing Shuttle computer software. Also a surgeon, Dr. Musgrave has published 44 scientific papers concerning aerospace medicine, exercise physiology and clinical surgery. This award-winning actress currently stars with Kevin Spacey in the science-fiction/fantasy K-Pax. She received a Golden Globe, an Emmy Award, an ACE and Screen Actors Guild Award for Best Actress for her performance in the 1997 HBO original movie, Miss Evers' Boys. Her second ACE award came for her portrayal of Winnie Mandela in HBO's Mandela starring Danny Glover. Woodard has also appeared in Down in the Delta, Love and Basketball, Disney's Dinosaur, Primal Fear and Follow Me Home. Versatile actor Blair Underwood is best known for his role as brash attorney Jonathan Rollins for six seasons on LA Law. In television movies he has portrayed legends in American history such as baseball's Jackie Robinson in the HBO original film Soul of the Game and civil rights martyr James Chaney in NBC's Murder in Mississippi. His film credits include Just Cause, opposite Sean Connery, and Possee. Gary Sinise's portrayal of Lt. Dan in Forrest Gump earned him an Academy Award nomination and propelled him into a mainstream movie star. His most recent feature film is in the sci-fi thriller Imposter. On Broadway he appeared in One Flew Over the Cuckoo's Nest. Sinise made his mark as a feature film director in Of Mice and Men. On television he most recently starred in the Showtime adaptation of Jason Miller's Pulitzer Prize-winning play, That Championship Season. LeVar Burton got his start in film at age 19 in the landmark TV miniseries Roots. In the late 80s, Burton became a member of the intergalactic ensemble of Star Trek: The Next Generation as Geordi LeForge. He reprised the TV role for the feature films Star Trek: First Contact and Star Trek: Generations. In addition to his celebrated acting roles, Burton spent more than a decade hosting and producing Reading Rainbow for PBS, an acclaimed children's show designed to instill an interest in reading.